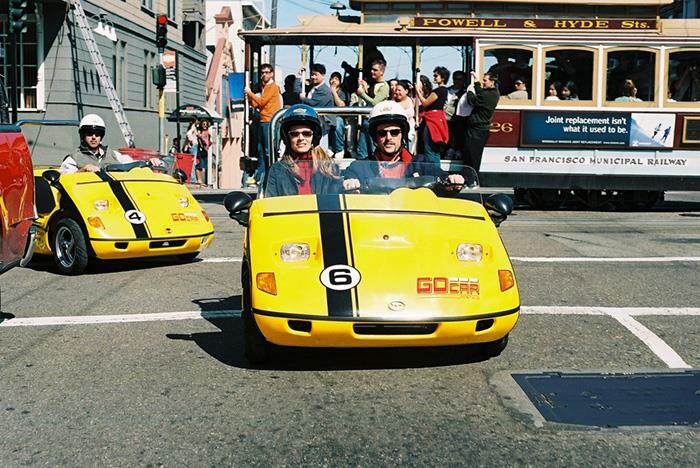 GoCar, the world’s first storytelling car, is the greatest way to experience and learn about San Francisco at the same time. GoCar shows you how to navigate through San Francisco while offering educational tidbits along the way. You can follow the guided map or make our own tour experience. Stop for pictures, see new sights, and discover San Francisco’s hidden treasures—it’s up to you! Tours leave every 15 minutes. 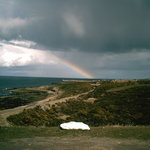 Choose what San Francisco sites you want to see. 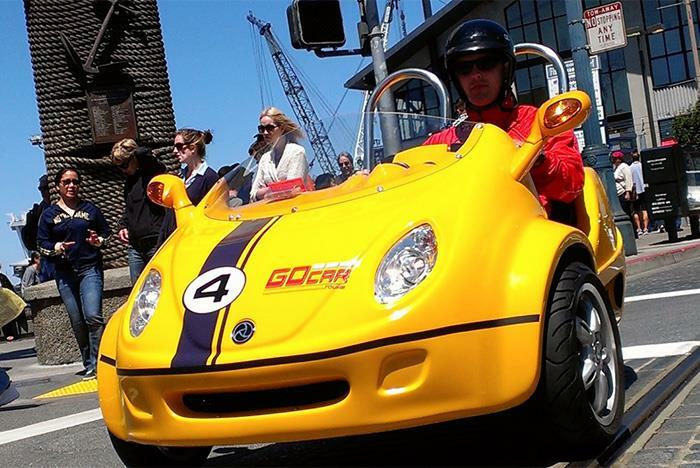 GoCar is the first-ever GPS-guided Storytelling car ® . 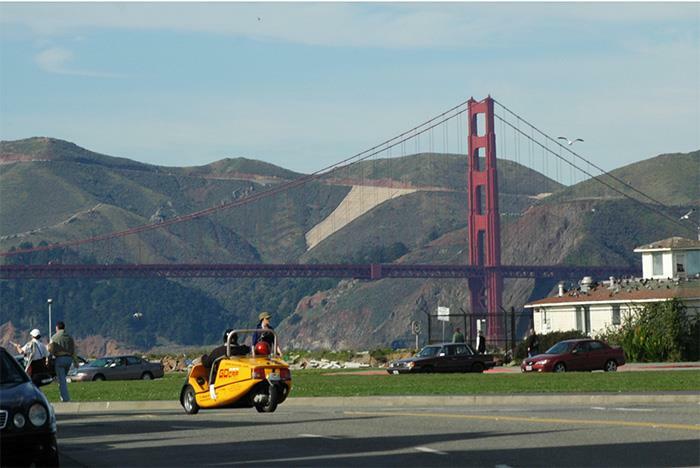 It’s the most exhilarating, entertaining and enlightening way to tour San Francisco. Experience what the press is buzzing about, what visitors rave about and what Time Magazine called one of the most amazing inventions of the year. Whether you want to drive the informative 49 mile drive cruise down the most crookedest street in the world or see the houses of the rich and famous, the GoCar can take you there. With over 200 points of interest you can you make the tour as long or short as you want. Best of all, the adventure happens at your pace. You can stop for photos, take detours, grab a coffee or break for lunch. (You’ll actually be able to park!) Or you can blaze your own trail and explore the city streets, neighborhoods and parks on your own. There are many exciting things to do in San Francisco. GoCar offers the best San Francisco tours available. If you haven’t experienced the GoCar – the world’s first-ever GPS-guided Storytelling car® – then you haven’t truly seen San Francisco. Whether you want to visit the iconic Golden Gate Bridge, take on the crookedist streets in the world, San Francisco’s Lombard St and get a selfie with your bestie in front of homes of your favorite celebrities, or take off on an epic, scenic 49-mile drive, GoCar is there for you. 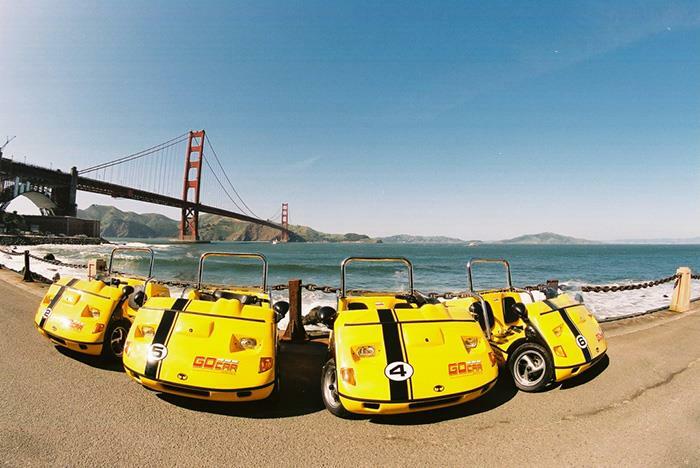 Your GoCar comes pre-loaded with more than 500 different attractions and points of interest throughout San Francisco. 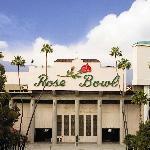 Of course, you can check out some of the most popular tourist San Francisco attractions in the world, including Alcatraz, Pier 39, and Golden Gate Park, but you can also visit some of the under-the-radar spots that only locals know about like Stow Lake and Pilots Row. Do you want a short, one-hour tour? We have you covered! Do you want to spend all day seeing what San Francisco has to offer? You’re in luck too because GoCar Tours lets you choose not just what sites you’ll see, but how long your tour will be. When you choose this truly unique way to see the city, you can stop whenever you want and you can blow by attractions as quickly as you want. Get the advantages of group travel without having to stop and wait for a boring tour guide. Stop for photos whenever you want, grab some delicious sourdough at Fisherman’s Wharf (where you can actually park thanks to the tiny size of your GoCar! ), or take a coffee break in the middle of the day. Tours start at 9:30am and leave every 15 minutes. Please select your desired tour time and arrive 15 minutes prior. Cars must be returned to rental location before dusk or at your scheduled time. 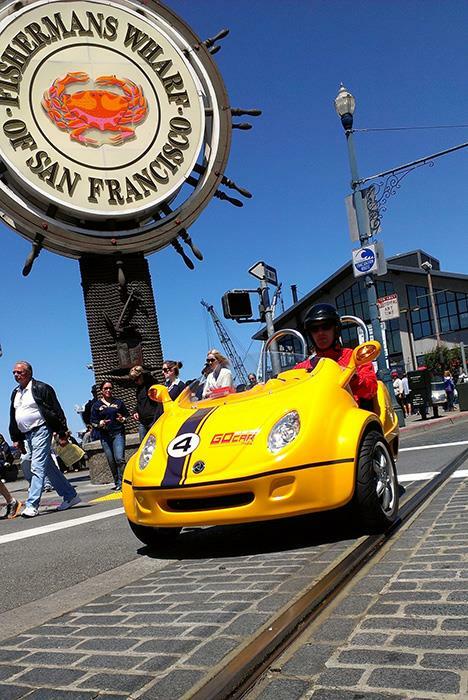 Have you been to GoCar San Francisco? Share your knowledge and be the first to review this. "SO MUCH FUN -- and you are driving on the street!" Have you ever wanted to drive down the crookedest street in the world? This adventure is for you! I'd recommend going first thing in the AM -- ideally on a weekday. That way you avoid most of the traffic and get to maximize your time. The car will tell you where to go -- so no need to worry about navigation. You can stop and explore as much as you want -- so good idea to book a good chunk of time. Arguably the best way to see the city. I'd do this again in a heartbeat, just for the pure fun of it! we hired 2 cars before we arrived in San Fran and went for the 9am 3 hours for the price of 2.. We got there around 8.40 which meant we had time to fill out the waiver, watch the video, get helmets that fit and understand how to operate the car to actually start driving at 9am. I had my daughter (12) in the car and my husband had my son aged 10. I thought i would be nervous but we specifically chose Sunday morning thinking that would be better for traffic - i 'think' we made a good call as there was hardly any traffic. We did the route that took us to the parks - we had been to fishermans wharf etc the night before. It was a lovely sunny day but a bit chilly - was glad of a fleece and sunglasses. The GPS system told us exactly where to go. We did a mini detour to see a House from a tv show my daughter had loved when she was younger but GPS picked us up. Highly recommended! Did the 2 hour tour starting at the wharf and had a blast. My only recommendation would be to arrive 30 minutes early rather than 15. They were understaffed and busy & even though we had a reservation we lost 30 minutes of our tour. We had dinner reservations. Lots of fun, get out and take pictures and enjoy the ride. 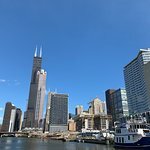 Can’t wait to tour the city next time. However long you want it to take! With a GoCar, you set the tour length. Yes. Take as long as you want at San Francisco landmarks, grab lunch, take some pictures—it’s completely up to you. Do we have to stay on the tour? No. If a landmark or destination isn’t included in the tour, simply use the map to guide you there. Can I cross the Golden Gate Bridge? No, our tour will navigate you to Fort Point. It is possible to gain pedestrian access to the bridge span from the car park at the bridge vantage point. Is the tour offered in multiple languages? How many people can fit in a GoCar? The car fits a maximum of 2 people. GoCar tours can go out rain or shine. How old do I have to be to rent a GoCar? Renters must be 21 years old and up. Can I use a foreign driver’s license to drive a GoCAR or do I need an International Driver’s Permit? 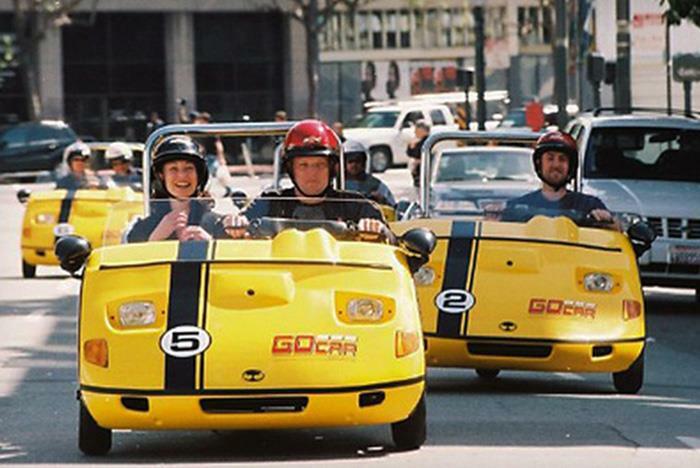 You can drive a GoCAR in California with any foreign driver’s license. If you have a foreign driver’s license that permits you to drive an automobile, then it also permits you to do so also in the USA.